This document was last updated in 2001, but the information is still relevant today. If you wish to repost or reproduce this information in print or on the web, you are free to do so but must follow the Creative Commons License attached to this document. 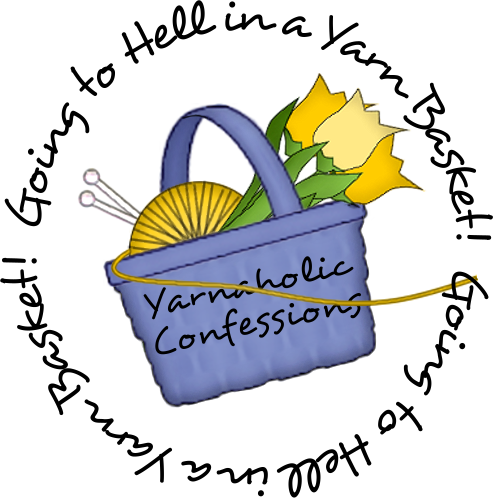 BY means giving credit to “Yarnaholic Confessions” and providing a link to this page. NC means Non-Commercial so you cannot use this document for commercial purposes (i.e. include in magazines, as part of course material, etc.). ND means No-Derivative, meaning you cannot distribute a derivative document based on this material. If you need clarification about this CC License or wish to vet your use of this document or ask for an exception to the above license (such as permission to use in a Guild meeting to educate members), please click on the outgoing mail envelope icon in the sidebar of this blog to contact me Thanks for your cooperation! As a somewhat long-time member of several knitting email lists where this topic has repeatedly generated heated discussion and occasionally misinformation, it is clear that knitters need access to user-friendly information on copyright and how it relates to our day-to-day knitting activities. In the interest of accuracy, completeness and ease-of-understanding, this document was reviewed by a panel of lawyers, librarians, knitwear designers, publishers, yarn shop owners and, of course, knitters. Thank you all for your help. I would like to especially acknowledge the advice and contributions of the following people in the development of this FAQ: Margo Lynn Hablutzel, Carolyn D’Agostino, Helen Pope, Dawn Brocco, Joan Hamer, Diane Piwko, Mary Hunt, Ruth Schooley, Colleen Hansen, Barbara Breiter and Esther Bozak. This Copyright FAQ is intended as a basic informational guide only and does not cover every possible situation under copyright law. The information presented in this FAQ is based on United States copyright law and, to the best of my knowledge, is correct as of December 2000. I am not a copyright lawyer. While being on these email lists has been a great educational experience (and thank you to all those people who have shared of their knowledge on this topic over the years), this “education” still doesn’t make me a copyright lawyer. Please do not write me with specific questions on copyright law, as I cannot advise you on legal matters. Only a copyright lawyer can assist you. If you are a copyright lawyer and find inaccuracies on this page, please use the contact form here to send me a message so that I can make corrections in the interest of providing accurate information. Your contribution will be acknowledged on this page. What is meant by copyright in this specific knitting context? Copyright is the body of law that protects a designer’s hard work in its tangible form as a written pattern, whether in hard print or on the Internet. Unless it says otherwise in the copyright notice, this includes the written words, photographs, charts, diagrams and any audio or video reproduction of the instructions. The copyright notice generally contains the following three elements: the word “copyright” or the copyright symbol, the year and a name. The use of “Copyright” or “©” indicates that the pattern as written is the original work of the copyright holder, whose name appears next to it. The year represents the year the work was created and the beginning date or renewal date of its copyright protection. The copyright notice usually is found either at the beginning of a book or in the masthead of a magazine, or at the beginning or end of a document. Most importantly, under current U. S. copyright law, anything given expression in a tangible form, as described above, and published after March 1, 1989 is protected by copyright law whether the copyright holder has included a copyright notice or not. What is covered in this Copyright FAQ? Q: I just found this great pattern in a book, but I don’t want to buy the entire book. Can I photocopy just the pattern I want? Q: Can the yarn shop photocopy the pattern from their “Store Copy”? Q: The pattern I want appears in a book that is “out-of-print.” Can it be photocopied? Q: What about magazines, newsletters, designer-published leaflets and the like? Can I photocopy patterns from them? Q: Under what circumstance can I photocopy a pattern? Q: I found a free knitting pattern on So-and-so’s website and I want to print it out or save it. Can I? Q: I don’t see a copyright notice on the pattern. What do I do now? Q: Can I share patterns I saved to my hard disk with others by email or by printing them? Q: So-and-so sent a copy of an original pattern s/he designed to our email/Usenet group without including a copyright notice. Can I forward it to someone else or post it elsewhere on the Internet or print it out and share it with others? Q: So-and-so really likes the (insert-the-project-of-your-choice-here) I made from a copyrighted pattern and s/he wants me to knit her/him this item as a gift. Can I? Q: So-and-so really likes the (insert-the-project-of-your-choice-here) I made from a copyrighted pattern and s/he wants me to sell her/him this item. Can I? Q: What about things I want to knit from a copyrighted pattern and donate to charity or to an auction? Is this OK? Q: What if I change the elements of the design to make it different from the original? Q: I want to design an item using a popular character. Can I? Q: I have some patterns that I don’t want any longer. Can I resell them? Why do I have to be concerned with this rigmarole in the first place!? This page has been viewed 36K times since its move to WordPress.com in April 2009.